We are in the process of creating the team schedules. Your child's coach will provide you with a schedule at the first game. 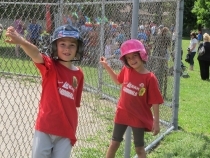 Weekday games start at 6:30 p.m.
Blastball games are played on either Monday and Wednesday OR Tuesday and Thursday. For 2019, our season will begin on Monday, April 29th, and run until Saturday, June 22nd. Schedules for the new season will be posted once registration is complete and the teams are formed.